Nicely decorated 6 Bedrooms and 4 Bathrooms with great second living area in the bunk room for the kids to play Wii! Accommodate 22 in this home with a King, 2 sets of Bunk Beds with a sleeper sofa in kids room, 2 Queens, 2 Queens, Queen, Queen. An inflatable mattress provided for extra sleeping. Private swimming pool can be heated from Oct-May for $75/day. Brand new, fully-equipped kitchen, quartz countertops, beautiful new cabinets, tile floors throughout, ceiling fans throughout. Brand new bedding and mattresses, flat panel television in each bedroom, large flat panel in main living space. Blu-ray player and DVD players. Wireless internet access. Other great amenities include pack 'n play, outside hot/cold shower, Keurig coffee maker, washer/dryer, gas grill, Wii gaming console. Dining on the front deck, or sit in the Adirondacks to watch the world go by. Pocket porch off the master bedroom. Dog friendly with an additional non-refundable pet deposit per dog. Limit 2 small, house trained dogs. NON-SMOKING. Sleeps 22. 6BR/4BA. First Floor: Queen (private bath), 2 Queens (shared bath), 2 Queens (shared bath). Second Floor: King (private bath), Queen (shared bath), 2 bunks/2bunks/sleeper sofa (shared bath). Q: Hi! How far is the beach access from this property? Thanks! 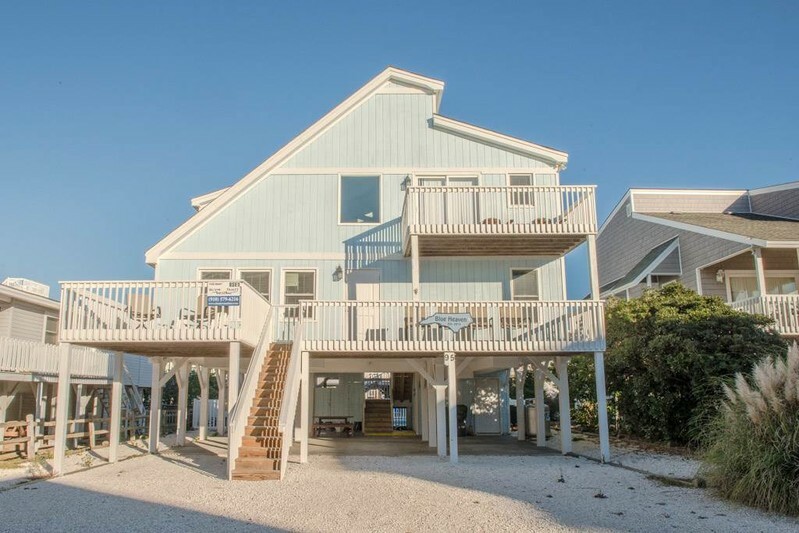 The beach is located across the street and less than 200 feet away from the nearest beach access.